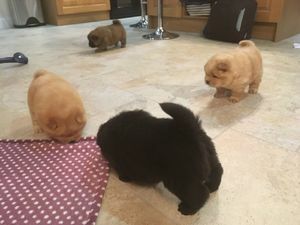 Our chow chow puppies are very well socialised both in / out of the house and very much around the children so well adapted to the house hold environment from a puppy stage . Please get in touch with me should you wish to reserve your little forever puppy , if you would like advice or even if you would like to talk about our chow chow. 4 weeks free insurance when we transfer the paper work . Due to busy work commitments , I may not be able to answer your calls or texts straight away . if this is the case please leave me a voicemail or email us and i will get back to you as soon as possible .